You’re trying to lose weight and you just want something that is practical and works. There is a lot of information out there on many different diets—but the best method to a healthy weight loss is a diet that can easily be incorporated into your everyday lifestyle. It’s no secret that when you’re trying to lose weight, it is important to burn more calories than you are consuming. Recent studies have shown that exercise alone does not significantly contribute to weight loss and therefore diet is critical. Modifying your diet to decrease the amount of food you eat may work for some but for most people it is a short term solution. Many times this leaves you hungry, and there’s a big chance you’re going to cave into those hunger pangs and consume more calories than what you would have had, had you not starved yourself in the first place. So How Do You Decrease Your Caloric Intake Without Feeling Hungry? There are two common nutrients—protein and fiber—that can increase satiety, leading to lower consumption of overall caloric intake. But which one does the trick for your healthy weight loss plan? Let’s start off with a high-protein diet. One study in the American Journal of Clinical Nutrition showed that subjects replacing carbohydrates with protein were consuming 200-400 fewer calories overall. Not only is protein very satiating, it also takes more energy for your body to metabolize than carbohydrates or fat. Because your body has no way of storing protein, any protein not utilized is metabolized and excreted, as opposed to excess carbohydrates, which, if not used, are converted to fat and then stored in your body. During starvation, your body breaks down about 50% of lean body mass and 50% fat mass. These percentages change depending on the food sources you are consuming. For instance, in a high-carbohydrate diet, 35% of lean mass is broken down compared to only 20% of lean mass in a high-protein diet. However, in order to maximize the benefits of building lean mass or preventing protein breakdown during healthy weight loss, you must maintain a positive protein balance, which only lasts about three hours after consuming a meal. Therefore, no more than 30-50 grams of protein should be consumed at each meal. Anything more than this and the protein is degraded and excreted. Unfortunately, many people tend to consume high loads of protein at one meal, generally at dinner time, compared to breakfast where only about 10 grams of protein are consumed. Healthy…But Only for Obese People? While a high-protein diet seems to be ideal for healthy weight loss, it is usually only warranted for obese individuals, to drop a significant amount of weight as a last resort to prevent surgery. 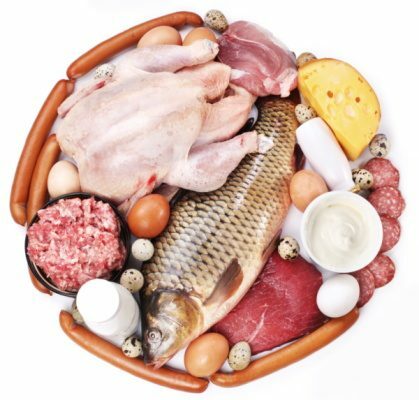 High-protein diets should be closely monitored by a multidisciplinary team that may include a primary physician, endocrinologist, dietitian, and psychologist. But is turning to a high-protein diet a healthy weight loss plan? High-protein diets have shown to have a minimal effect on LDL (bad cholesterol) levels likely because on high-protein diets, you’ll usually be eating more red meat—and therefore increasing your intake of saturated fat, total fat, and cholesterol. Further, consuming low amounts of carbohydrates can alter your mood and leave you fatigued. However, many studies have shown beneficial effects for high-protein consumption as part of a healthy weight loss plan. For instance, it can decrease circulating insulin and triglyceride levels as well as increase HDL (the good cholesterol) levels. High-protein diets have also been associated with healthy weight loss. For instance, one study found that when controlling food consumption and exposing the participants to a high-protein diet, body weight remained stable and satiation increased. The interesting part was when they were free to consume as much as they wanted after finishing a high protein meal, they were still found to lose weight (mostly fat loss). When comparing studies of high-protein diets to high-carbohydrate diets, weight loss has been shown to be significantly greater among high-protein diet participants for up to six months. After evaluating the effects at 12 months or beyond, results have been insignificant. There has been a lot of evidence supporting that high-protein diets play a role in increasing satiety and influencing weight loss, however, in terms of healthy weight loss and keeping those pounds off, the evidence is lacking. One review study evaluated dietary approaches to managing type 2 diabetes. When evaluating weight loss, consuming either a low glycemic index diet or a high-protein diet compared to a control diet showed no significant results. However, when comparing the Mediterranean diet (a diet rich in legumes, fruits and vegetables, and unrefined cereals—all great sources of fiber—and low in dairy and meat—rich protein sources) to a regular diet, it was found that participants adapting this lifestyle had achieved a significant healthy weight loss. When you want to start your healthy weight loss plan, it’s important to be aware of the foods you eat and how they can help you lose weight. But is eating more protein the only solution? Stay tuned for part two of this article, and find out what role fiber plays for your healthy weight loss. Ajala, O., et al., “Systematic review and meta-analysis of different dietary approaches to the management of type 2 diabetes,” The American Journal of Clinical Nutrition 2013; 97:505-516. Fogelholm, M., et al., “Dietary macronutrients and food consumption as determinants of long-term weight change in adult populations: a systematic literature review,” Food & Nutrition Research 2012; 56. Rebello, C., et al., “Dietary strategies to increase satiety,” Advances in Food and Nutrition Research 2012 69:105-182.